Educate the public about the coastal environment and how they can make a difference in protecting their beaches. Participants conduct bi-monthly surveys of over 150 miles of coastal beaches from Point Ano Nuevo in San Mateo County north to Bodega Head in Sonoma County. 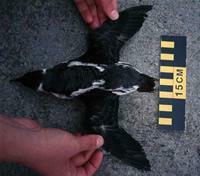 Volunteers collect data on live and dead species of birds and marine mammals. They also report violations, detect oil pollution, and collect oil samples. To become a Beach Watch volunteer, you must be 18 years old, attend all required training, and commit to surveying your beach for a minimum of one year. Currently a Beach Watch training is not anticipated in the near future. The 80-hour training is held on weekends and weeknights and includes classroom and field training. Prior to the training, potential volunteers need to attend one orientation session. This will be an opportunity to find out more details about Beach Watch including the training schedule, list of open beaches, and applications for training. "Cheat sheets" and other survey guidance is also accessible to volunteers on the website. Data is available through the Beach Watch online query system, and is also published through Association and sanctuary reports, such as the "Sanctuary Condition Report: Summary & Findings"
Beach Watch surveyors conduct oil spill sampling and tar ball retrieval to assist the California Office of Spill Prevention and Response to detect and analyze the source of oil on coastal beaches. Surveyors with special training participated in a multi-agency response to oil spills in the San Francisco Bay, Point Reyes National Seashore and along the San Mateo coast. Several specimens of rare and endangered wildlife have been discovered and documented by Beach Watch volunteers, including a rare Cuvier's beaked whale, a species little known to the scientific community. The evidence gathered by Beach Watch volunteers helps the Federal government document the damage to wildlife and habitat from oil spills. In 1996, this resulted in a $7.7 million settlement from a spill within the San Francisco Bay and Gulf of the Farallones. In 1998, this resulted in a $9.4 million settlement from an oil spill along the Central California Coast.